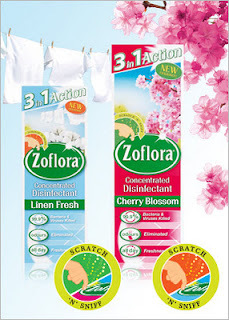 Zoflora Concentrated Disinfectant comes in small containers of 120ml or 250ml. It won't add much weight to your shopping and it won't fill up much of a shopping bag. The box has a scratch 'n' sniff panel to allow you to experience the aroma to help you decide from the many varieties available. It eliminates 99.9% bacteria. Including e.coli, MRSA , salmonella, listeria, influenza (H1N1), human herpes virus & RSV. Odours are eliminated. Household smells such as drains, bins and pet area smells are a thing of the past. I went on a mad disinfecting spree throughout the house these last couple of days. I found Zoflora easy and pleasant to use. The rooms I've used it in have ended up with a long lasting, fresh smell. The smell is not overpowering like some products. Also many disinfectants smell very clinical and not all that plesant, but I found Zoflora's scent to be quite nice, like an air freshener. and I never noticed any ill-effects. It dries as quick as it would if it was just water and then the area you've cleaned is ready for use again. I was a little surprised that it doesn't have a child-proof lid. Zoflora concentrated disinfectant can be used for general disinfection of surfaces by diluting 1 part disinfectant to 40 parts water - it's small but goes a long way! The 120ml bottles make almost 5 litres, and the 250ml bottles make 10 litres. At this strength it is suitable for floors, tiles, worktops, sinks, toilets, hard surface pet areas, potties, dishcloths, drains, taps, baths and more. You can also use it as spray to create a fragrant freshness throughout the house. Limited Edition Apple Orchard: An uplifting fragrance combining the freshness of cut grass and spring. Bouquet: Traditional and popular the rich floral scent of bouquet with its warm wood and musk notes creates a heady fragrance. A mixture of floral with a hint at the orient. Citrus Fresh: Family favourite, clean & fresh with an orange warmth & lemon sharpness. It's a cleansing, refreshing and uplifting fragrance which blends citrus fruits including orange, lemon and lime to create a modern fresh scent. Flowershop: Sweet, light and feminine with hints of green leaves and freshly cut stems. An easy going aroma for relaxation. Hyacinth: A rich, sweet floral capturing the scent of the flower, creating a positive and uplifting atmosphere. Lavender: Lavender is a fresh uplifting herbal combination enriched with essential oils of orange, lemon, eucalyptus and rosemary. Full flowery and herbaceous. Lilac: With subtle hints of Jasmine and Rose, Lilac is a light floral fragrance that creates a beautiful background scent. Linen Fresh: A crisp, refreshing blend that captures the outdoor freshness of light breezes over clean linen, and brings it into your home. Rose: Rose captures the richness of the flower and is a soft warm floral fragrance. The full floral blend is comforting and enchanting. Springtime: The sparkling blend of cut grass, green leaves and soft herbal flowers is similar to a light breeze that refreshes the home, leaving a clean uplifting aroma. Sweetpea: Sweetpea is a fresh delicate bouquet, good for lifting emotions. Bright, light, it's an easy going summer inspired fragrance. Warm Cinnamon: Let the sweet and spicy aroma of Zoflora Warm Cinnamon fill your home with scents of cloves. You can find out all the details on the Zoflora website: www.zoflora.co.uk which also has interesting user-submitted ideas for uses. "Tried and tested by generations, this antibacterial disinfectant range contains an effective odour neutraliser and smells so fresh and fragrant you'll want to use it everywhere. There are many products on the market that effectively kill germs but unfortunately, many of them aren't very kind on your nose. Triple Action Zoflora is different. This powerful concentrated antibacterial disinfectant liquid not only kills 99.9% of bacteria and viruses, but also contains a powerful odour elimination ingredient and beautiful long lasting fragrance leaving your home hygienically clean and fresh. It is also particularly effective in areas where odours may be an issue, such as rubbish bins, toilets, damp rooms and clean-ups of vomit, pet accidents, spilt milk etc." Interesting about how many bugs it kills. I wonder does it also kill C.Diff (because only chlorine kills that).